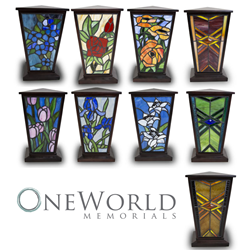 After two years of successful R&D, this exclusive line of Tiffany-Style stained glass urns will be sold directly through the OneWorld Memorials' website and showroom. The use of stained-glass art offers an appealing new take on Cremation Urns and Keepsakes. Our idea was to use the color and versatility of stained glass to elevate cremation urns and related memorials to works of art. OneWorld Memorials is boosting its reputation as an innovative online cremation urn and memorials retailer with a new line of Tiffany-style stained glass cremation urns and keepsakes offered directly through their website and showroom. Hand-crafted in the style of legendary stained glass artist Louis Comfort Tiffany, the OneWorld Memorials Stained Glass Collection offers a stunning array of floral and geometric patterns in color palettes ranging from deep iris blues to crisp yellows, fiery reds, and emerald greens, mimicking the natural beauty found in the petals of wildflowers and the plumage of songbirds. Colored glass dates back to Ancient Egypt, and stained glass has been used for centuries by skilled artisans in the construction of church window murals, glass lamps, and the windows of homes and businesses. Many believe the art hit its modern peak in the work of American artist Louis Comfort Tiffany (1848-1933). Tiffany’s glass mosaic lamps were so magnificent that they helped define an entire period of design. Today, they fetch premium prices in art auctions around the globe. OneWorld Memorials had worked with stained glass in their sympathy gift collection. They knew the potential of the material to capture, project, and reflect light. But their insistence on product designs of the highest caliber meant a development process lasting nearly two years. The process complete, OneWorld made a major investment to secure the exclusive rights to these stunning products. OneWorld Memorials is a leading developer and retailer of cremation urns and memorial products, including urns for ashes, cremation jewelry, remembrance and sympathy gifts, pet cremation urns, and memorial keepsakes. OneWorld delivers value to the consumer by offering products of exceptional craftsmanship at prices that fit every budget.